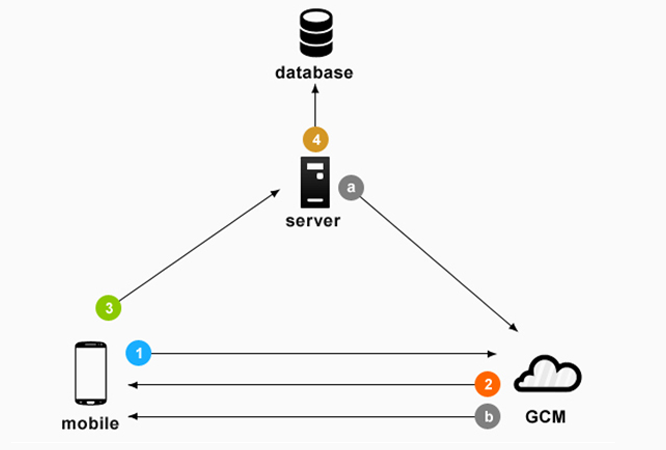 Google Cloud Messaging (GCM) is a service that enables developers to send data from servers to both Android applications or Chrome apps and extensions. The service provides a simple, lightweight mechanism that servers can use to tell mobile applications to contact the server directly, to fetch updated application or user data. The service handles all aspects of inquiring of messages and delivery to the target application running on the target device. Google Cloud Messaging (GCM) for Android allows developers to send and receive different types of messages to and from applications installed on Android devices. A developer can, for example, send messages that contain up to 4KB of structured data from a server the developer owns through a Google-run GCM server to all user installations of the developer’s GCM-enabled apps. The applications don’t even have to be running on user devices as the received messages will be broadcast by the Android OS and the targeted apps will be woken up. The GCM message data can include links, text advertisements, or commands.